From head wear to foot wear, you need clothing that can withstand the outdoor climate, and that is also easy to pack and travel. For example, T-shirts and outer-wear clothing and gear should be lightweight, comfortable, durable, and should even come equipped with moisture management fibers. Foot wear should also be comfortable, breathable, lightweight and ventilated for the days you do a lot of walking, hiking or other outdoor activities, be it in the summer or winter, and they should be easy and flexible enough to pack in a backpack or travel cube. Read on to check out the top six examples of outdoor apparel for 2016. The performance polyester spandex fabric is lightweight. Flex 360 construction is contoured to allow great freedom of movement. CLIMALITE fabric for superior moisture management. 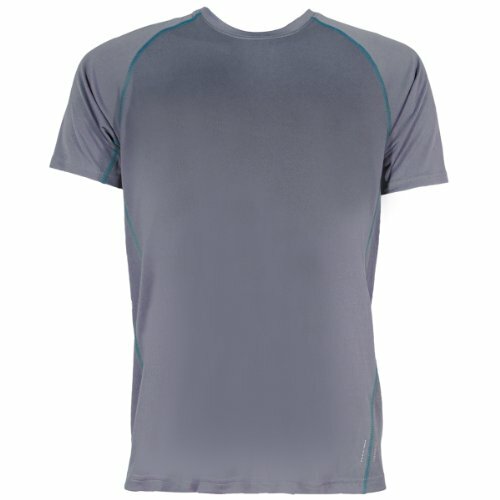 Want a lightweight wicking shirt to pack that is cheap enough to buy in twos and threes? Check out this Climalite Flex 360 version from Adidas that’s a real deal. I don’t have a set packing list where I’ve got the exact same items along on every trip, but there are a few staples that do always go in, including a couple pairs of synthetic wicking t-shirts. These versatile items can work for casual wear or activities with serious sweating and when you need to wash one, you can do it in a sink and have a dry t-shirt again in a few hours. You can pay a lot of money for such a simple item though, edging up toward $100 for some brands. Adidas is a brand made for the masses though and they’re trying to produce things the average weekend athlete can afford. So you’ll see this Flex 360 shirt going for $20 or $24 maximum, often in the teens. So if you want to pack multiple colors, no sweat. You’ll have no sweat clinging to you either. These shirts are lightweight and cool, drying quickly when they get wet. The extra touch with this Climalite version though is there’s a mesh panel running down each side under the arms. I’ve worn one of these on at least five trips now, doing things like hiking around Peru and paddleboarding, and that extra ventilation really seemed to make a difference. You also get some features usually only found in much more expensive tees. The seams are flat, first of all, and the shoulder ones are positioned so that they’re not rubbing against a backpack strap (or a squats pad) in the place of most pressure. Plus the Flex 360 Crew is treated with some kind of additive making it odor resistant. There’s no mention of what this might be, but in my sweaty real world tests it worked well. One of the great benefits of these tees for travelers is that they’re so easy to pack. They’re very light, they don’t take up much room, and they tend to hold up better over time than cotton t-shirts. You could pack a few for a round-the-world trip and they’d do fine for a year straight if you wanted them to. Not bad for $20 a pop or less. Otherwise get it at Amazon and if you don’t see the size/color combination you want, look at the “customers also searched…” section as the colors are split up on multiple pages for some reason. Upper: Comfortable EVA padded and pre-shaped straps. Midsole: Molded footbed out of soft EVA. Midsole/Outsole: Climacool tooling construction for enhanced breathability and comfort. Climacool vents and integrated mono-mesh in the outsole increase ventilation. Get ready for summer cool with these Adidas water-ready sandals. 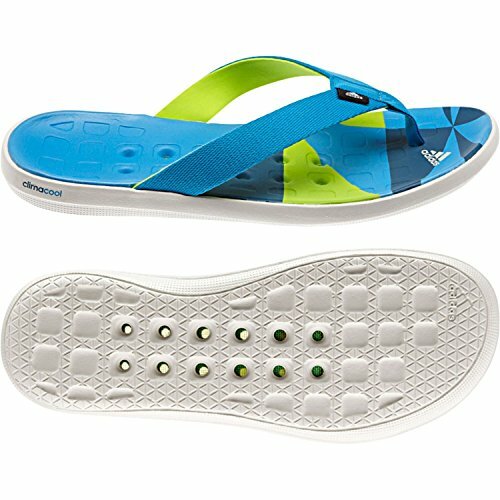 Apparently footwear companies don’t like the term “flip-flops,” but that’s what I’d called this Climacool Boat Flip “sandals.” You get your typical webbing on top, with a rubber part that goes through the space between your big toe and the next one. These are better quality than the ones you’ll pick up at a beach souvenir shop though, of course, and the holes in the bottom let the water flow right through if you wear these on a boat or some other place where you’ll get wet. I also found they kept the soles of my feet cooler too. I’ve been fortunate enough to be away from the harsh winter that hit a lot of places the past four months and got to try these out on beach trips to Nicaragua and Zihuatanejo/Ixpata. Both great places to kick back in flip-flops for a while. These were comfortable enough that I could walk all day in them without getting sore feet. They’re the best in that respect since the Freewaters GPS ones I reviewed last year. They’ve got a serious footbed with some give to it, but contoured to provide some real support. The non-marking sole has a reasonably sticky tread on it for when you actually are on a slippery boat or dock. The whole shoe dries quickly, including the lined strap. The weight is all of six ounces and they pack flat, so packing these for a beach trip won’t add much to your load. You can just rinse them off at one of those foot showers by the beach when it’s time to pack them up. With the ventilated holes, they also don’t seem to build up odor like a lot of sandals, the ease of cleaning making it even easier to keep them fresh. The Climacool Boat Flip sandals come is seven colors—some more subdued than the ones pictured here—and max out at a list price of $45. So it’s not going to cost you a lot to have some traveling beach sandals that will treat your feet right and keep them cool. Get them online atZappos, Amazon, or Sun & Ski. 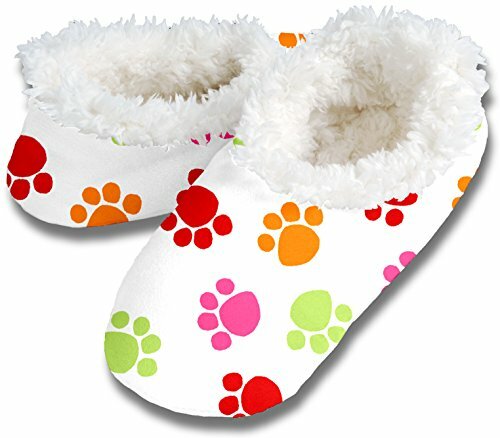 Comfortable and warm slipper style sock. Features a safer no skid sole. Lined with a soft Sherpa fleece. Fun printed paw pattern on exterior. Cold feet, I have them. No matter the destination, be it Homer, Alaska, or Hana, Hawaii, I don’t ever seem to be quite warm enough. I have, for over a decade, packed wool socks and fleece slipper socks for every single trip. This brings to the forefront my issue with Snoozies slippers as a travel companion. They’re fuzzy, they’re way comfortable, and they come in super wacky patterns. You can get them in kids’ sizes and they’re very light — it’s easy to find space for them in your luggage. They’ve got grippy stuff on the soles so you won’t slip on the hardwood, linoleum, some third slippery surface floors. But the soles are fabric, so you don’t want to be wearing them in the messed up airplane lavatory where the person before you has, oh, let’s say they’ve been overzealous in their hand washing and splashed all over the place, just to keep it from being too icky. In order for these slipper to be really travel friendly, they need a sole that’s not going to act as a sponge when you step into a little over-spray. Good thing they’re machine washable. It’s too bad they’re not more versatile because, I rather like them. They won’t work for the plane, but they’re fine for your cabin or hotel room. I’ve slept in them when it’s cold — they don’t stay on, but I didn’t really care about that. I wouldn’t call them a travel essential — you could get the same use out of a good pair of fuzzy socks. When they’ve got a version that packs as small and is as comfortable but comes with a water resistant sole, I’ll revise my conclusions. Shaft measures approximately 10″ from arch. Cushioned upper with seam-sealed waterproof construction for comfort and dryness. 250g 3M Thinsulate LiteLoft insulation for warmth. White Spider Rubber outsole for grip and traction. Don’t get confused by the names: men and women are set up with nearly the same winter boot this year from Teva, simply with different titles and slightly different design. The Teva Chair 5 for men and the Teva Jordanelle 2 for women both feature Thinsulate insulation, a grippy sole, and lace-up closure. And they’re both adorable. 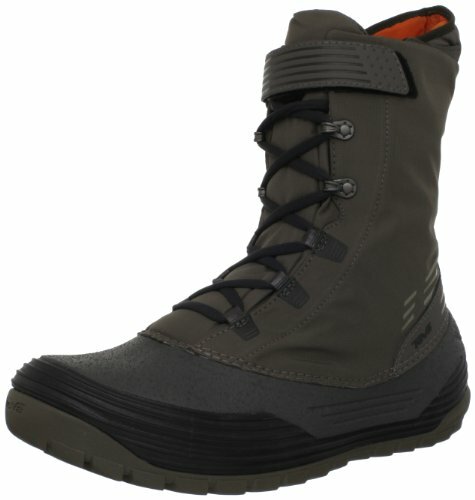 With waterproof uppers and seam-sealed construction, both boots offer winter weather protection with 250g insulation. Both feature a removable boot liner, which makes getting the boot on and off much easier. Both lace up the front to mid-calf with easy hook-and-loop construction, and open wide so there’s no wiggling and whining while getting your wool-socked foot in (or is that just me?). Lace-up boot featuring cushioned shaft and gripping outsole. Crushable synthetic upper and ThinsulateLoft insulation. My favorite thing about the Jordanelle and Chair, however, is their weight. 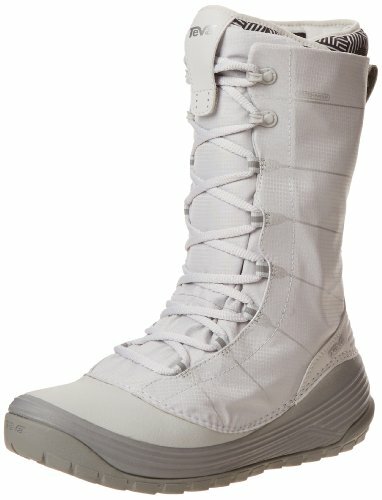 These boots are incredibly lightweight, considering the traction they offer. I can pack these boots when we travel to ski…even the size 12 Chair 5 my husband is wearing. Teva claims the Chair 5 and Jordanelle are approximately half the weight of comparable winter boots, and I believe them. Plus, both styles are crushable, so feel free to cram them into your suitcase…all will be good. You can literally fold the boot in half. We took our Teva boots on a whirlwind Thanksgiving weekend in the snow, and while I usually curse my decision to bring winter or snow boots along for a road trip by mid-day of day 1, this time, I never minded. That’s because my Jordanelles were in my duffle, not rattling around the back of the car, to big to fit anywhere else. The Chair 5 retails for $170 for men at Teva, but you can pick up a pair at Amazon for as low as$78. Colors include black and green. The Jordanelle retails for $180 (hey, no fair!) but can also be found on Amazon for $121. Color options include black, white, and purple. Also available at REI and Backcountry. Moisture wicking NatureTek Nylon feels and wears like cotton but made for life on the road. Offers two and even three levels of security on every pocket. There are hidden mini pockets inside the front pockets. Water & wrinkle resistant, moisture wicking NatureTek Nylon. In the time since this video, you can read more Practical Travel Gear reviews on P^Cubed clothing, including men’s shorts and a men’s shirt. Obviously, this is a brand we stand behind. Finally, it’s the women’s turn. At the request of a female Practical Travel Gear reader, I reached out to Clothing Arts to review the new women’s P^Cubed pant now available. Out of the box, I enjoyed playing with all the cool anti-pick-pocket features. Like the men’s pant, the women’s version is made of soft nylon that repels stains and is water resistant. You get multiple secure pockets, all with theft-deterring zippers or flaps. The women’s pant is a bit more streamlined than the men’s: the two front pockets lie completely flat when zippered, and the two side cargo pockets are relatively small as well. The pant comes in three inseam lengths, which ensures that they will fit almost anyone right out of the box. As a shorter person, I appreciated the 28″ length, and 30″ and 32″ are also available. The women’s cut is flattering over the hips and down the thighs, and the waist is adjustable with the two-button belt-less system. Let’s talk about the security pockets. On the women’s model, you get two front pockets that zip closed upward instead of downward (a small, simple measure that deters pick pockets) each with a smaller hidden pocket inside. These pockets are ideally sized for credit cards or spare change. Because these pockets feature zippers and not flaps with buttons, they’re your go-to place for items you need secure but also need to get at often, like cash, a credit card, or a phone. Below these pockets you get two streamlined cargo pockets, each with flaps that button. The left cargo pocket includes a secret, zippered pocket on the inside (in addition to the cargo pocket) that fits a passport, small wallet, or ID. On the back, you get two more buttoned, flap pocket on the rear, one of which again features a double-secure zippered pocket. No pick pocket is going to manage to unbutton your pocket, find the zipper, unzip it, and steal your stuff. Oh, and did I mention the pant folds up to be a capri? That’s a nice extra feature. I took my P^Cubed pants on a week-long trip to the Yucatan Peninsula of Mexico to try them out. I don’t necessarily feel unsafe in Mexico…actually, the two times I’ve had items stolen from me–a wallet and a phone–the crimes occurred in my own driveway of my suburban American home. I guess I need Clothing Arts to make me a pick-pocket proof Toyota. Maybe some flaps over the windows. But I took the pants with me, filled the pockets with my cash and my wallet and phone, and headed out to tour Mayan ruins and the busy pedestrian streets of Playa del Carmen. If anyone targeted me for theft I didn’t know it, but I do know that the pants were comfortable even in heat and humidity (in capri mode) and spills, dirt, and sweat wicked off the nylon. The pants didn’t wrinkle easily, and they packed down small. They’ll be coming with me to tour Alberta, Canada national parks next month, more for their travel-compatability than for their anti-theft features. At $99.95, P^Cubed pants are an investment, but I consider them gear rather than clothing. They’ll perform for you time and again as go-to pants for travel all over the globe. Pick them up directly from Clothing Arts in khaki, olive, or gray in sizes 4-20, but be advised: they’re already popular! At the time of this post, sizes under 10 had temporarily sold out. What weighs 1/3 the amount of a pair of jeans, is twice as strong, and also repels water? These Titanium Expedition travel pants, that’s what. It used to be that the only way to reduce the amount of weight you were carrying when you traveled was to pack less, buy smaller sizes of cosmetics, and get a light bag. Now the clothes that you pack can make a huge impact as well. Considering you could pack three pairs of these Columbia Sportswear pants for the same weight as a pair of denim jeans, multiplying decisions like that across your wardrobe can make a huge difference. You get a whole lot more performance out of these as well. They’re not called Titanium just for marketing spin. In my tests on the road they repelled a spilled glass of wine, beaded up in a drizzle, and also stayed looking good for a week: a damp rag cleaned off a bit of dirt that was showing one day. They’ve got four pockets—always a good thing—but three are mesh inside to keep things cool while the back one is zippered for security. It’s hard to find pants with any innovative “features,” but these do have something cool I haven’t seen before: the leg pocket has a removable pouch inside with a drawstring. You could use this to fly through security at the airport by putting all the metal inside and then just tossing the pouch in a bin. On the other side, stick it back in with the Velcro. Or you can remove it and toss it on a dresser at your hotel to keep keys and the like in one place. The pants have 50 SPF sun protection in case you’re so pale you can get burned through your pants and there is a fleece lining around the waistband to keep it comfortable. What I like most about these pants is the double-duty aspect. They look good enough to wear into a “no jeans” restaurant or club but can hold up to what you throw at them in the outdoors. You can put these Columbia Titanium Expedition travel pants on in the morning and know they’ll work for whatever you’re doing until bedtime. They come in colors meant for matching: khaki and gray. OK, so they don’t convert to shorts when it gets hot on the trail like some travel pants, but they don’t say, “I’m a tourist” either when you walk into a bar. They’ll run you 70 bucks if not on sale, which puts them in designer jeans territory, but you’ll probably still be using these in five years, no matter what is happening in the fashion world. I would take these on a year-long round-the-world journey knowing they’d still be in great shape when I returned—even if I wore them every day or two. 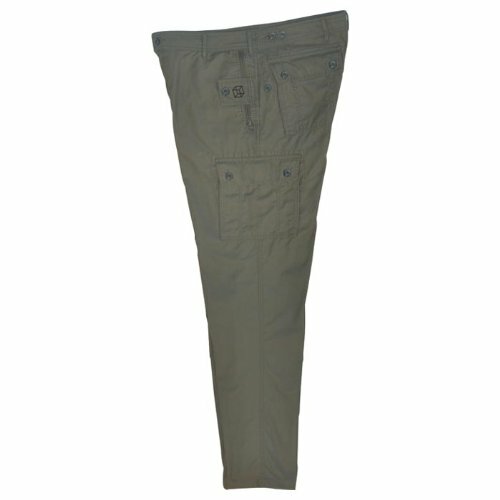 Get more details at the Columbia Sportswear page for these travel pants. This particular model is for men, but Columbia makes plenty of great pants for women.